The development of new industries such as electronics, telemechanics, production of semiconductors, luminophores and other implies the use of a number of materials, little studied until now . They include selenites and tellurites of transition elements, especially rare earths. Their study is firstly directed to the examination of their structural features [1,2]. Not less important for studying the properties of this class of compounds are the studies on thermodynamic properties. The information in this area are too scarce [3,4]. Selenites are important intermediates in the technology of production and purification of selenium. Thermal decomposition and oxidation of selenides, selenates and selenites is a complex heterogeneous process, and details on the composition and thermal stability of the oxidation products are of interest for the selenium metallurgy and for the study of their properties as a semiconductor material. The information in literature concerning the receipt and study of the properties of selenitite and selenidite of lanthanides are a little [5,6]. The increasing diverse use of different selenium compounds (in particular ytterbium) makes their study is a topical issue. The purpose of this study is to synthecise the selenides and selenites to ytterbium and characterization of their chemical and thermal properties. As initial substance is used ytterbium oxide containing basic substance not less than 99.99 mass.% hydrochloric acid of high purity. Ytterbium selenite is obtained by the following methodology: Yb2O3 is dissolved in concentrated hydrochloric acid, the excess of which is removed by aqueous solution puff. The obtained anhydrous chloride is dissolved in water and thereto is added the aqueous solution of sodium selenite we also prepared by mixing equimolar amounts of an aqueous solution of SeO2 and NaOH / 99,99 mass.% /. After standing in the concentrated solution the precipitate is filtered, washed to a neutral pH and dried in air. Determination of Yb as Yb2O3 is performed by direct complexonometric titration with 0.05M solution of complexone III in xylenol orange indicator. Determination of the selenium dioxide is based on the use of the iodometric method for the determination of selenium . Dust samples were tested at room temperature with devices DRОN-3ХL (Russia) equipped with a Cu tube or DRОN-UМ1 (Russia), equipped with a Co tube. For x-ray tubes of Cu or Co anodes are used respectively Kβ-Ni or Kβ-Fe filters. Thermogravimetric analysis was conducted by company’s derivatograph MOM (Hungary), type OD-102. Ceramic crucibles are used, and α-Al2O3 as a standard. The heating rate is 10°С/min in the temperature range 25-1000°С. Studies were conducted in air. The resulting selenite was used to load the glass ampules «Razoterm» in the concentration range of 0 to 75 mass.% SeO2 in a liquid phase to a hydrothermal synthesis and thermostated at 100°C for 30 days. For building the solubility isotherm of the system data from chemical analysis is used, applying Schreinemakers methods. Fig. 1 shows the solubility of the system at 100°C. Fig. 1 Solubility isotherm of the system Yb2O3–SeO2–H2O at 100°C. 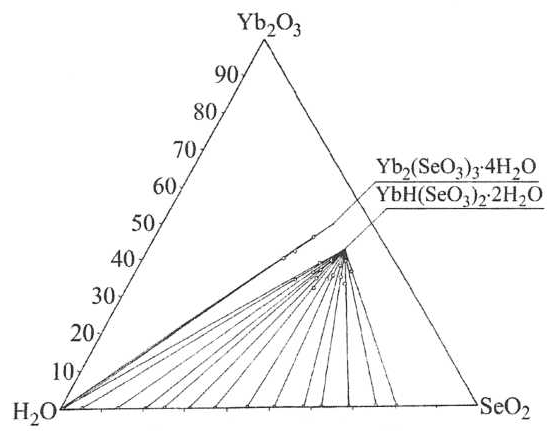 Figure 1 shows the formation of two crystallization fields of the corresponding phases Yb2(SeO3)3.4H2O and YbH(SeO3)2.2H2O. It can be seen that the field of crystallization Yb2(SeO3)3.4H2O is less/almost in a stoichiometric ratio of the reactants/ than that of YbH(SeO3)2.2H2O at this temperature. The resulting phases in the systems are characterized by chemical, thermogravimetric and X-Ray diffraction analyses. Lauegramma is taken from hydrogenselenites for x-ray diagram definitions used in monocrystals. Based on the results obtained from a monocrystal x-ray study on hydrogenselenites of Sm, Dy to Yb, we offer the following composition of the resulting diselenite – YbH(SeO3)2.2H2O. Our crystallographic study confirmed the essential features of the explored structure described by . X-Ray diagram parameters are as follows: Crystal system — orthorhombic, space group Р212121; unit cell parameters: a = 6,547, b = 6,922, c = 16,316; V = 739,4; number of units Z = 4, X-ray density Dx=4,268 g/cm3. 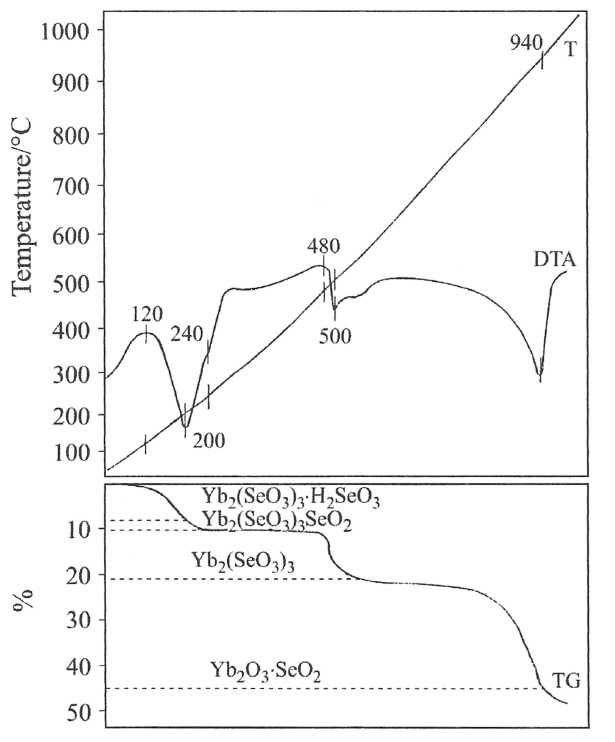 Thermal stability of selenites Yb2(SeO3)3.4H2O and YbH(SeO3)2.2H2O was investigated by thermogravimetric, non-isothermal methods. Figures 2 and 3 represent the TG and DTA curves of the obtained selenite. The mechanism of thermolysis is demonstrated by chemical and X-Ray diffraction of insulated phases obtained in the modeling of the thermal analysis conditions. The reduction is carried out in a quartz reaction tube placed in a tube furnace /figure 4/. Hydrogen is fed at a rate of 4-6 ℓ.h-1. Isothermal hold is performed from 2-4 h at different temperatures. 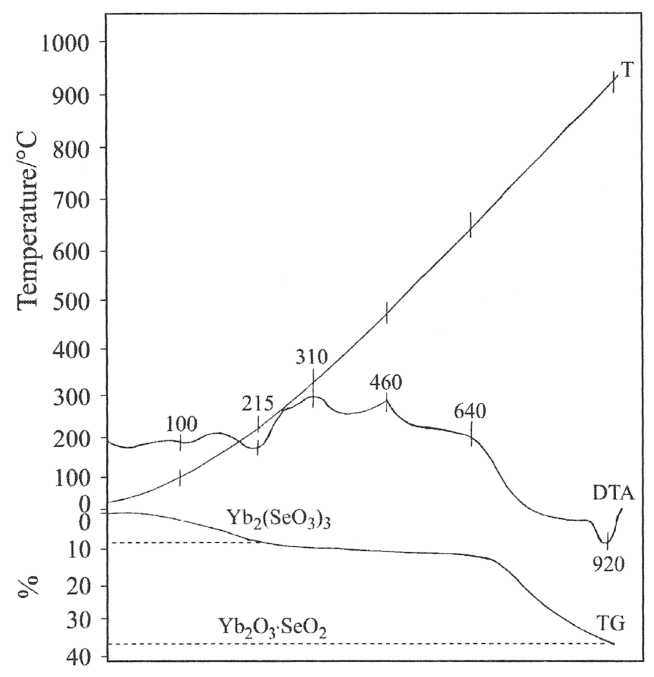 The isothermal heating time is determined by the extent of the respective crystallized selenite and the temperature of the dehydration and amorphization of Yb2(SeO3)3. Amorphized Yb2(SeO3)3 is characterized by high reactivity. In the first stage of the selenite reduction form polyselenides with Yb2Se4 /YbSe2/ composition. In their further calcination in a hydrogen atmosphere /10 ℓ.h-1/ selenides are prepared with Yb2Se3 composition. The obtained ytterbium selenides and polyselenides are fine polydisperse systems and an X-Ray diffraction analise is used to determine the parameters of the crystal structure. Considering the isomorphism of lantanoidite selenide, the method of Debye-Scherrer based on literature data was used to calculate the Yb2Se3 and Yb2Se4 unit cell parameters [9,10]. As a result of this study selenides and selenites of the ytterbium are synthesized. Their composition is proven through chemical and X-Ray diffraction analyses. The thermal resistance of the selenite is studied. Koskenlinna M., J. Valkonen, Acta Chem. Skand., 1977, 457-460. Серебренников В. В., В. Г. Попова, Изв. Вузов. Физика , 1958, №1, 173-174.